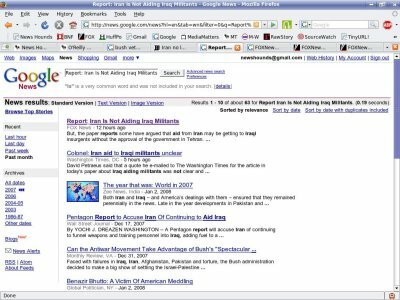 Yesterday morning 1/3/08 FOXNews.com ran a story that referred and linked back to a Washington Times piece that said Iran is no longer supplying weapons or training to insurgents in Iraq and had in fact curtailed the practice in October 2006 - three months before the "surge." Last night the story changed to one where General Petraeus denied the Washington Times story. FOX did not issue a retraction or correction, they simply disappeared the earlier story and replaced it with General Petraeus' denial. 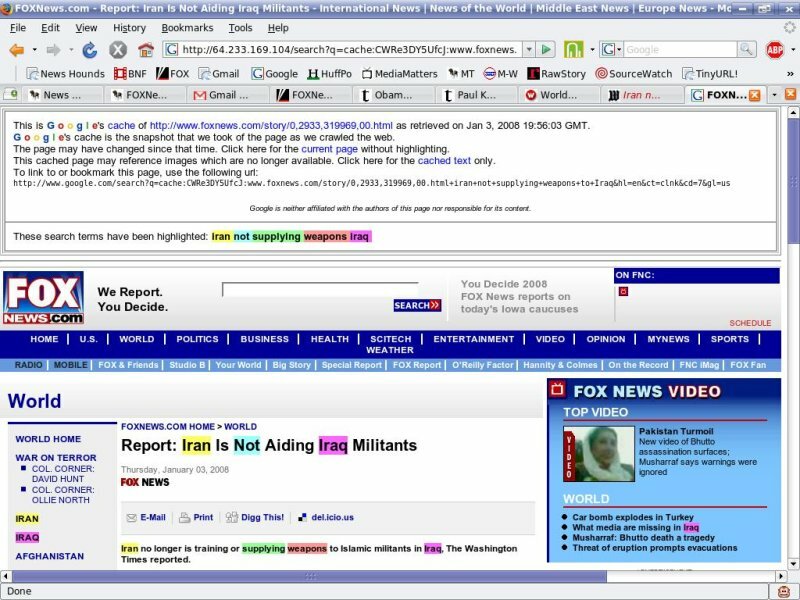 The hyperlink http://www.foxnews.com/story/0,2933,319969,00.html, originally went to the story headlined "Report: Iran is Not aiding Iraq Militants." Petraeus aide Col. Steven Boylan was originally quoted as saying "We are ready to confirm the excellence of the senior Iranian leadership in their pledge to stop the funding, training, equipment and resourcing of the militia special groups. "We have seen a downward trend in the signature-type attacks using weapons provided by Iran." He later "told FOX News that the article, purported to include quotes from Petraeus and Boylan, 'is inaccurate.'" Regardless, FOX should have left the original and published the follow-up rather than scrubbing the earlier one. One wonders who told the FOX webmasters to do that, and if it's considered S.O.P there? Or only when they get direct orders to remove a story that contradicts the official White House talking points?